As a recruitment agency, getting the right candidates from the right areas is a tricky task in itself, not to mention attracting and retaining the right clients. Throw in a lack of social media presence, sporadic marketing campaigns, poor site optimisation, and an over-reliance on traditional, interruptive marketing techniques, and this task becomes even more of a challenge. This is the situation our client found themselves in before they came to us. They weren’t hitting their business goals and their website traffic wasn’t as high as most of their competitors’ were. Basically, they needed a marketing plan for a recruitment agency that would boost candidate acquisition - and they needed it fast. Our client, a recruitment agency, specialises in the marketing, creative, and research industries. Since its conception in 2001, they’ve successfully placed hundreds of candidates into marketing agencies across the UK and Europe. They’ve also provided tailored recruitment solutions for businesses of all sizes, helping them to find the right talent for their team. The company operates with 12 employees and produces £700K in yearly revenue, with a particularly strong presence in the South of England. Our client was up against some pretty serious competition, and the pressure to outperform them was ever-increasing. Prior to working with Angelfish Marketing, the recruitment agency had limited help from other marketing agencies and freelancers, who helped them with some basic social media and the creation of their website. However, their current marketing plan for a recruitment agency was ineffective; a combination of poor site optimisation, ineffective content campaigns, and irregular social media posting was still holding them back quite significantly. As well as this, the company were reliant on using traditional outbound marketing techniques such as cold-calling, which was preventing them reaching their full potential. The recruitment agency’s goals centred around acquiring more candidates, but their current methods needed to change in order to achieve this. So they made the decision to hire Angelfish Marketing to help transform their marketing. The challenge, for us, was inheriting a weak marketing programme and a content-deprived website; it was essentially a blank canvas. As well as this, the recruitment company had a limited budget, meaning that we needed to be as resourceful and effective as possible. We wasted no time in producing our marketing plan for the recruitment agency. This is something we do for all of our inbound marketing clients in order to give both parties a clear understanding of their marketing goals, and how we intend to get there. Holding workshops with the client, we created detailed buyer personas, analytical competitor reviews, an in-depth content strategy, and achievable goals. We measured the results of our inbound marketing methods using HubSpot and Google Analytics, which we started in April 2018. In April 2018, our client’s website was showing traffic of 793 website sessions. However, after implementing our marketing plan for a recruitment agency and inbound methodology, it hit its peak at 4,295 sessions by January 2019. The month before our inbound campaigns started, the site was registering at 484 organic sessions. By month nine, the website had 756 organic sessions representing a 56% increase in traffic to the website. 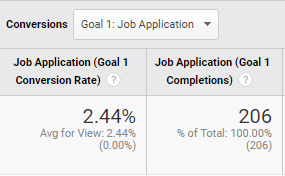 75% of job applications via our client’s website were now coming from organic traffic. This increase in organic traffic was due to our on-page SEO, technical SEO, and content marketing programme. This led to a significant rise in search visibility within the identified set of keywords. Previously to working with us, our client was ranking for just six of these keywords. Now, they rank for over 80, including new targeted keywords. The month before our inbound campaigns started, the site was registering 7 sessions from social media. By month nine, the website had 1,905 sessions representing a 27,114% increase in traffic to the website! Once we started generating these new leads, we started to focus attention on converting them from candidates to applications. Prior to engagement, no tracking was in place for job applications on the website; it was the poorest performing route to job applications compared to other job boards that were in use. Once we implemented our marketing plan for the recruitment agency, which included an effective inbound strategy, our client began to see really positive results - from a large increase in website traffic, to more CV applications. All of this then led to them outperforming 9 out of 13 core job boards, all in just 9 months. Embracing inbound and digital marketing is the future for the recruitment industry, and will help any agency to get ahead of the competition in a fiercely competitive market place. In the meantime, why not download our guide to digital marketing for recruitment agencies? It covers everything you need to start getting more leads, including how to optimise your website, create great content, nurture leads into customers, and more.